As we mentioned before, the IBM POWER8 has a memory subsystem which is more similar to the Xeon E7's than the E5's. 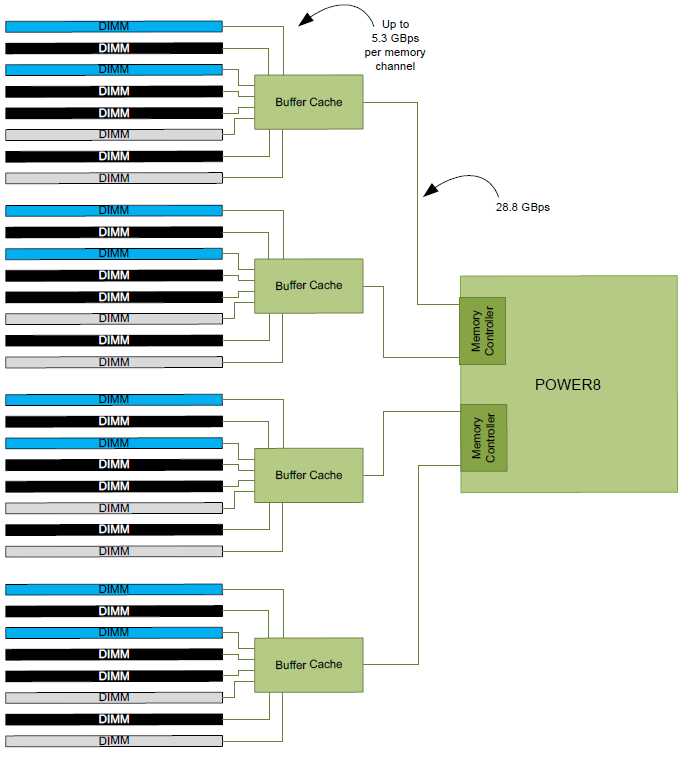 The IBM POWER8 connects to 4 "Centaur" buffer cache chips, which have both a 19.2 GB/s read and 9.6 GB/s write link to the processor, or 28.8 GB/s in total. So the 105 GB/s aggregate bandwidth of the POWER8 is not comparable to Intel's peak bandwidth. Intel's peak bandwidth is the result of 4 channels of DDR4-2400 that can either write or read at 76.8 GB/s (2.4 GHz x 8 bytes per channel x 4 channels). The latter option makes sure that stream tests with array sizes which are not cacheable by the Xeons' huge L3 caches. It is important to note why we use the GCC compiler and not vendors' specialized compilers: the GCC compiler is not as good at vectorizing the code. Intel's ICC compiler does that very well, and as result shows the bandwidth available to highly optimized HPC code, which is great for that code in the real world, but it's not realistic for multi-threaded server applications. With ICC, Intel can use the very wide 256-bit load units to their full potential and we measured up to 65 GB/s per socket. But you also have to consider that ICC is not free, and GCC is much easier to integrate and automate into the daily operations of any developer. No licensing headaches, no time consuming registrations. The combination of the powerful four load and two store subsystem of the POWER8 and the read/write interconnect between the CPU and the Centaur chips makes it much easier to offer more bandwidth. 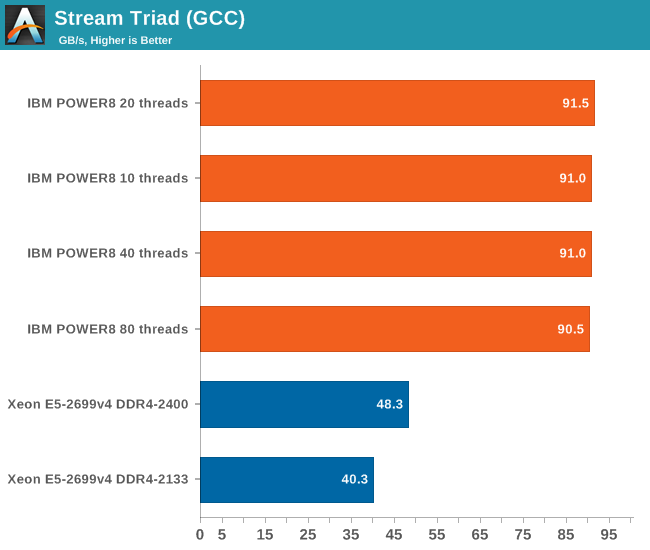 The IBM POWER8 delivers a solid 90 GB/s despite using old DDR3-1333 memory technology. Intel claims higher bandwidth numbers, but those numbers can only be delivered in vectorized software.